What Is Self-Reflection And Why Is It So Powerful? As we each journey along our own unique pathways through life, there is an incredible power in taking time for self-reflection. Self-reflection is different than meditation, or even setting intentions. Self-reflection is when you set aside some time to simply review where you are, where you’ve been, and where you’re headed. It’s when you look honestly, and without judgment at your life to see where you’re on track and in alignment with your soul mission and purpose, and where you could use a little realignment or upgrade. It's easy to get caught up in the busy-ness of life… The chaos of challenges, and even the comfort of routines that are less than what you really want to experience. Self-reflection is incredibly helpful in understanding who you really are, where you want to be, and where you're actually headed. 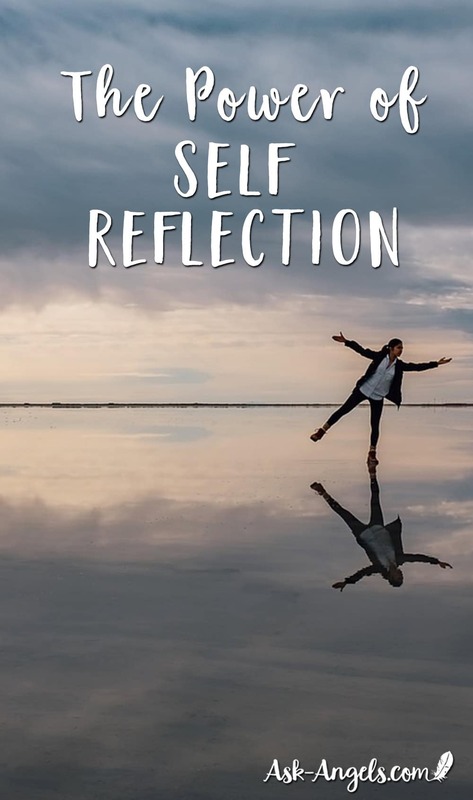 Self-reflection empowers you to learn from your mistakes, grow through challenges, and consciously progress on the path leading towards where you really want to be. So What Does Self Reflection Look Like? Grab a journal, cozy up with a mug of tea, and start to look at who you are, what you've been doing, and where in your life you'd like to see some positive changes and upgrades. Look at your life honestly… But its also important not to judge where you are or where you want to improve. “Where am I on track in my life? What am I doing now that's in alignment with my soul purpose? What are my core intentions? Where have I gotten off course this past year? How can I more fully stand in my authentic truth and shine my light? How can I serve with joy and love in the highest interest of all? As you practice self-reflection — presence, compassion, divine neutrality, and returning to love are key. When you do, the Universe can align you with so much more than you've ever imagined! Reflection now paves the way for expansion to come! Both individually and on a vast collective scale. … Add to this list! Next, tap into your imagination, and start thinking about what your most vibrant possible life really looks like. What do you really want to see, do, be, and experience in your life? What are you doing, feeling and experiencing? Think about how magical, wonderful and fabulous the upgrades you're calling forth in your life will be. What does your upgraded life really look like? What will really excite, fulfill, and inspire you? Take some time to journal about this and put into writing, in as much vivid detail as possible what it is you really want to experience. The purpose of this self- reflection prompt is to identify the areas you want to improve and then really focus and get detailed about what an upgrade looks like for you! What do these areas of your life look like when they're upgraded from where they were before? So you can step forward in your life with a new sense of focus, clear-intentions and with your outlook positively realigned. Bless you and your dear ones Angel. I do do a lot of self-reflecting .One thing i feel i need to add. When i was a child in 1972 ,about 5 years old, I was watching star trek with my Father and i asked him for one of those things that Captain Kirk would talk through.I always remember him saying “that will never happen son”. Then and now i see that i was right,but more of a feeling than a ,I told you so.A little inside smirk as so to say.Now i am 50 years old and out the other side into the true reality of life ,i notice this is so much like what has happened to quantum evolution as we have known to understand life by. The fact that everything in the last 50 years has changed ,so fast and intensely ,that one could never dream it to be .